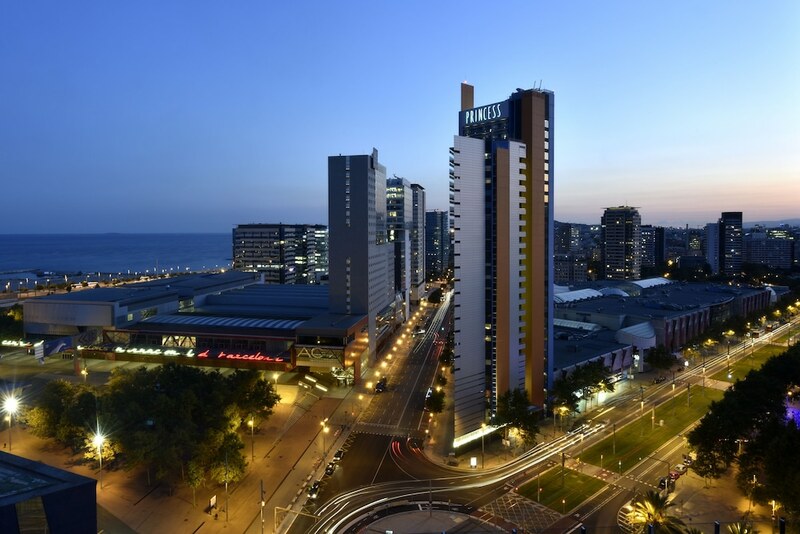 Located in Diagonal Mar i el Front Maritim del Poblenou, Hotel Barcelona Princess is adjacent to Barcelona International Convention Centre with other popular attractions like Sagrada Familia within a within a few miles (5 km). This 363-room, 4-star hotel welcomes guests with 2 outdoor pools, 2 restaurants, and free in-room WiFi. It's connected to a shopping centre in central Barcelona and also close to Palau de la Musica Catalana and Barcelona Cathedral. Enjoy dining at one of 2 on-site restaurants including Estrella, which specializes in Mediterranean cuisine. Order from 24-hour room service to satisfy your hunger without leaving your room, or explore the hotel and get a beverage at the bar/lounge or 2 coffee shops/cafés. Start each morning with buffet breakfast, available for a fee from 7 AM to 10:30 AM. Guests can expect to find free WiFi and 21-inch a flat-screen TV with satellite channels. The bathroom offers a hydromassage showerhead, hairdryers, and free toiletries. Other standard amenities include free minibar items, free bottled water and a laptop-compatible safe. Guests staying at Hotel Barcelona Princess enjoy access to 2 outdoor pools, a fitness centre, and a sauna. If you drive, self parking is EUR 23 per day, and there's also an area shuttle for a fee. Multilingual staff at the front desk are standing by 24/7 to help with luggage storage, tours or tickets, and dry cleaning/laundry. Additional amenities include a rooftop terrace, free WiFi in public areas, and a 24-hour business centre. Hotel Barcelona Princess features 2 the outdoor swimming pools, a sauna and a fitness centre. Dining is available at one of the hotel's 2 restaurants, and guests can grab a coffee at one of the 2 coffee shops/cafés. The property also has a nearby snack bar/deli. Guests can unwind with a drink at one of the hotel's bars, which include A poolside bar and A bar/lounge. A computer station is located on-site and wireless Internet access is complimentary. This 4-star property offers access to a 24-hour business centre. This business-friendly hotel also offers a rooftop terrace, spa services and tour or ticket assistance. Limited on-site parking is available on a first-come, first-served basis (surcharge). Hotel Barcelona Princess is a smoke-free property. Cash transactions at this property cannot exceed EUR 2500 due to national regulations. For further details, please contact the property using the information in the booking confirmation. Only registered guests are allowed in the guest rooms. The property has connecting/adjoining rooms, which are subject to availability and can be requested by contacting the property using the number on the booking confirmation. Parking height restrictions apply. Book a stay in any room or rate category and receive a modem for free WiFi around the city.